First of all I must congratulate you on successful completion of two years of the above publication. I fully endorse your ‘objective’ of bringing much needed awareness in the present generation of our community about ‘Sindhyat’, which includes our rich cultural heritage. 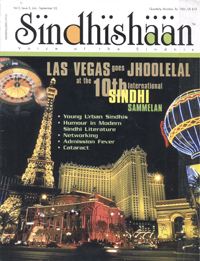 Our Prestigious publication “Promoters & Preservers of Sindhyat” which has been very ably reviewed by you in the last issue of Sindhishaan is also meant for younger generation of our community. It showcases the sacrifices and significant contributions made by our stalwarts including writers, poets, educationists, journalists etc. to ‘save’ our language & identity from total annihilation. I must tell you that your ‘mission’ of spreading finder points of our language and culture is well received by our community. I will quote a small example in support thereof. Some days back when I visited Khar Gymkhana library, I saw a youngster reading ‘Sindhishaan’ which is kept in the Magazine shelf. I felt very happy when I saw this. This proves that our younger generation is attracted to such literary magazines. I must also give you full marks for its contents. Each article is well thought of and has a ‘purpose’ and evokes appropriate response. Each issue apart from having beautiful ‘get-up’ is printed on quality art paper and surely it is worth preserving. I have preserved all issues published so far. Ranjit, you belong to illustrious family of “Butanis” your grandfather Principal Butani was one of the acknowledged ‘Guru’ of Dada Ram Panjwani. He was a true ‘Soofi’ and treated Dada Ram as one of his own sons. Principal Butani was an eminent educationist and was in possession of rare qualities unparallel in that era. He gave away for more than what he received in life. You seem to have inherited a few noteworthy traits from him, particularly your love for the Sindhi language and culture. Keep up your good work and continue carrying the mantle to younger generation.